You have a question about a project. You ping a coworker, who texts another colleague, who emails a listserv and receives 3 responses. And the problem is: where will your supervisor find the answer next month, when someone else asks the same question? Corralling the cacophony of texts, tweets, and emails is a serious undertaking. Some of the free tools designed to manage communication and increase efficiency now have federal-friendly terms of service (TOS) agreements. 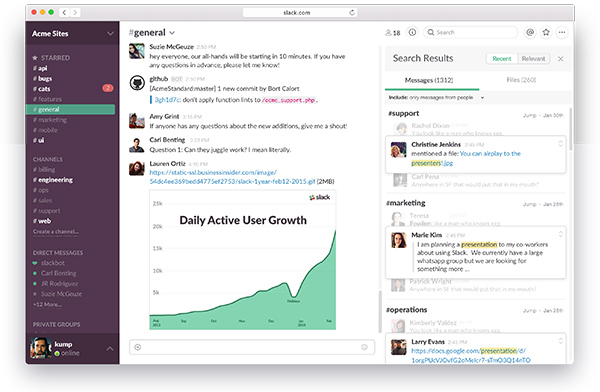 One of the new federal-friendly tools designed to lighten your communication load is Slack. Instead of locking team conversations in emails or 1-on-1 private messages, Slack offers “channels” where group members can share information, comment on each other’s ideas, and upload documents. Every conversation that is part of the channel is saved and searchable. Organizations and agencies are using Slack to streamline their efforts and have one centralized, easily accessible place for internal communications. The search functionality is a key selling point for some. McDaniel said her nine person team moved to using Slack for internal communication after finding Google Hangouts unreliable. Members of the Social Media Community of Practice praised Slack for being easy to learn and easy to manage. The Bureau of International Information Programs (IIP) at the Department of State has deployed Slack in its bureau, and over half of the bureau’s 350 staff are active, meaning they are logging in and posting, says Hilary Brandt, Director of IIP’s Office of Policy, Outreach and Governance. To encourage adoption in the bureau, they’ve been holding short, internal training sessions on Slack and have even had an “email-free Slack day,” Brandt says. Slack offers a suite of integrations as part of the tool, and it can also be used in conjunction with If This Then That (IFTTT), another federal-friendly service that links different tools and platforms together. For example, you can use IFTTT to integrate all your social media posts into Slack for an at-a-glance view of your activity across channels. In response to a privacy breach earlier this year, Slack now offers two factor authentication. To protect the security of all your social media accounts, DigitalGov offers a Social Media Cyber-Vandalism Toolkit filled with practical steps and instructions.